What are your "must-have" iPhone or iPod touch apps—the ones you can't live without? (Figuratively speaking, I hope.) Please omit apps that come pre-installed. Check for duplicates before adding new answers. If you find a duplicate, vote it down and encourage its poster to upvote the original entry instead (and remove the dupe). Please exclude iPad-only apps from here; there's Great iPad Apps for those. Conveniently access files in your Dropbox on the go. The official Twitter client. Previously known as Tweetie 2. Wifi remote control for iTunes music library (or Apple TV). This is made by Apple but doesn't come pre-installed. If you're into Facebook, their official iPhone app is pretty good for staying connected with people. Records a few seconds of what you're currently listening to and then shows you information about this song. Shazam is quite old by now, but still an amazing piece of software that's always useful from time to time. If you use 1Password on your Mac, the iOS app is quite handy. It can be linked to a Dropbox account therefore keeping data synchronized between your desktop and iOS device. There are regular and pro versions available for both iPhone and iPad. An alarm clock that analyzes your sleep patterns (using iPhone accelerometer) and wakes you in the lightest sleep phase. After trying different note-taking apps like SimpleNote and Evernote, I discovered this beauty a few days ago and it immediately replaced the built-in Notes app for me, both on my iPhone and my iPad. It fit my needs perfectly, and is really simple & beautifully designed. YMMV, but it's free to try. P.S. Elements is a feature-packed alternative with Markdown support and built-in email, but I'm not sure I need those features and it's $4.99. Task management tool. The todo items can be synced (over wifi) with OS X and iPad versions. SoudHound seems a lot faster than Shazam. Will start to try to match a song even before the full capture. It also identified songs that Shazam didn't. And SoundHound's free version allows unlimited matches, while Shazam allows 5 per month. Cydia is a software application for iOS that is a graphical front end to APT and the dpkg package management system. It allows a user to browse and download applications for a jailbroken iPhone, iPod Touch or iPad. In addition to messaging, iPhone, Android and BlackBerry WhatsApp Messenger users can send each other unlimited images, video and audio media messages. Best way to read Wikipedia. Note-taking in a better interface than the default Notes application (no Marker Felt) and notes are synched to a server for easy backups and viewing elsewhere. Task management application that uses the Getting Things Done (GTD) organizational method. Also available for Mac and iPad. For listening to music off the internet (directly on wifi/3G or via offline playlists). NB: Spotify is only available in certain countries, and Spotify Premium (€9.99 or £9.99 per month) is needed to use the iPhone app. Now with iOS 4 + iPhone 4 (unlike with my unjailbroken iPhone 3G earlier) the experience is really good, as you get background play and ability to use normal iPod playback controls (e.g. the headphone remote). In other words, it's similar to using the built-in iPod app, except that you have approximately 10 million tracks available at your fingertips. It’s a fast, beautiful and fun way to share your life with friends through a series of pictures. Snap a photo with your iPhone, choose a filter to transform the look and feel, send to Facebook, Twitter or Flickr – it’s all as easy as pie. It’s photo sharing, reinvented. Everyone probably knows about Pandora Radio by now. Put in a favorite artist and it helps you locate similar artists. It's helped me find many new bands. Great little mobile photo editor! A great puzzle game with tons of levels. Kept me playing for days, and I've still been unable to beat a couple levels after a couple months of having the app. There is also a free version. Intuitive, fun, and brain exercising. Soulver is by far the most useful calculator app in the App Store. It's a much easier and more powerful way to work with numbers over a normal calculator. Embed text with your calculations to make it easier to see the problem you are solving. You can easily go back and make a change earlier in the calculation and have everything updated, similar to a spreadsheet. You can use several lines and reference previous lines in your calculations allowing yourself to split up long equations or even reuse parts to see different results. These can all be saved on separate sheets so it's easy to go back and reference them later. You'll never go back to a normal calculator again. The best way to manage your tasks. Reeder is the best RSS reader for Google Reader. 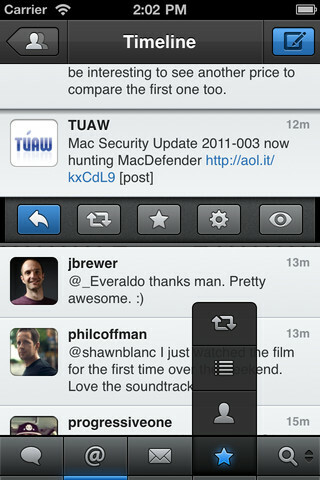 But Pulse is much nicer to randomly read various feeds. Not the answer you're looking for? Browse other questions tagged iphone ipod-touch applications . What are the great iPhone apps to discover new music?